T-Mobile in December 2017 announced plans to acquire Layer3 TV Inc. and use it as the backbone to launch a disruptive TV service in 2018. A year later, T-Mobile and CEO John Legere conceded the service wasn’t yet ready and would be pushed back into 2019. On Wednesday, the nation’s third largest wireless provider was finally ready to introduce its reworked offering. 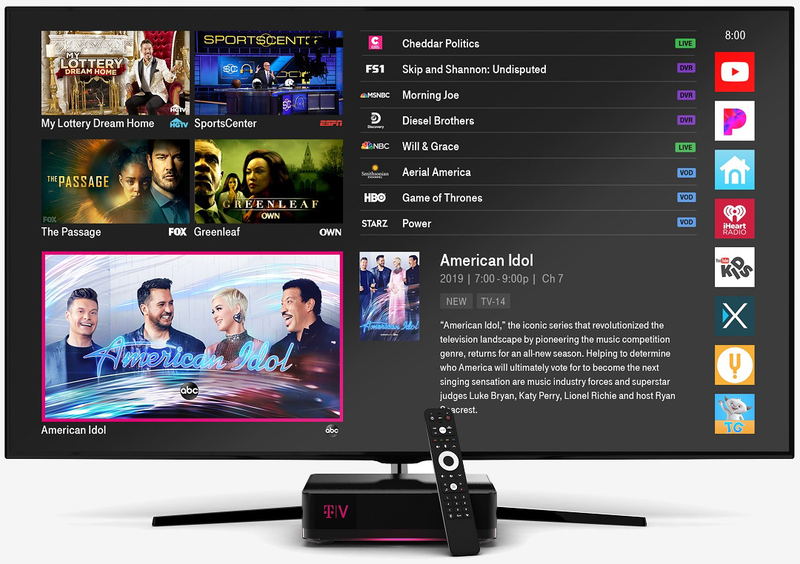 T-Mobile TVision Home is an upgraded version of Layer3 TV that’ll launch first in eight markets including Chicago, Dallas-Fort Worth, Los Angeles, New York City, Philadelphia, San Francisco, Washington D.C. and Longmont, Colorado. Additional markets are expected to join later this year. T-Mobile TVision Home features dedicated customer care, no hidden fees, no bill creep or exploding pricing. You get one consistent price of $90 per month (including a $9.99 per month discount for T-Mobile customers) for 150+ channels of local broadcasts, regional sports and more. You’ll also pay $10 per month per connected TV which gets you a whole-home DVR. Any premium packages, like HBO or Showtime, will incur additional expenses. T-Mobile said 74 percent of American households currently pay an average bill $107.30 per month. T-Mobile is also offering to pay off early termination fees from satellite providers up to $500 through its new Satellite Freedom program. T-Mobile TVision Home launches on April 14 in T-Mobile stores and online in the aforementioned areas. Additional details can be found on the official TVision website. Cable TV by any other name does not smell any sweeter to me. "T-Mobile TVision Home features dedicated customer care, no hidden fees, no bill creep or exploding pricing. You get one consistent price of $90 per month (including a $9.99 per month discount for T-Mobile customers) for 150+ channels of local broadcasts, regional sports and more. You’ll also pay $10 per month per connected TV which gets you a whole-home DVR. Any premium packages, like HBO or Showtime, will incur additional expenses." Total Rip-off! Not to mention that you would run out of your ISP data limit in no time (most likely in less than a week live streaming 4K contents on your home multiple 4K TVs)! Do yourself a favor and get an ATSC roof or attic antenna which is ISP Data Limit exclusive to get OTA TV broadcast for free!